The African Wild Dog (Lycaon pictus) is one of the African continent’s biggest assets with regards to wildlife. This iconic species is highly respected and loved by researchers, conservationists and tourists alike for their unique approach to parenthood and survival. 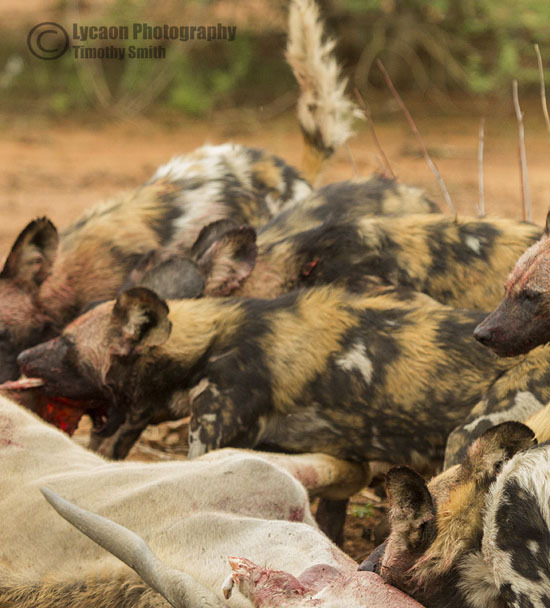 Wild Dogs have two very drastic ways of life that strangely intertwine. The careful and loveable upbringing of their pups is their main focus, sometimes leaving the hungriest of dogs having to regurgitate the small bit of food in their stomach to ensure the health and safety of the pups. 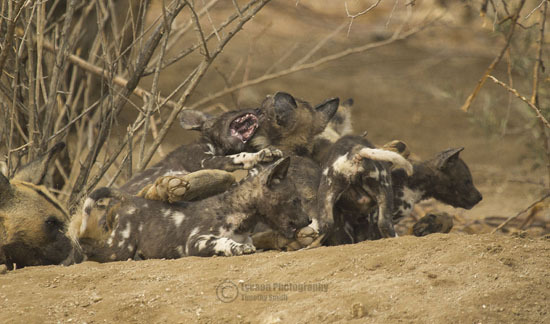 However, primal brutality is imbedded in the hunting strategies and styles used by African Wild Dogs. 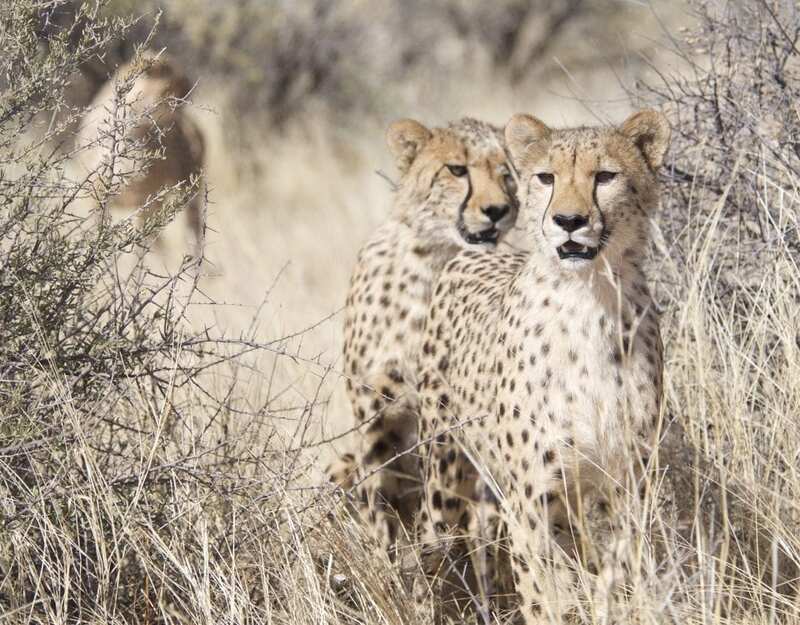 Forget stealth and subtleness of the big cats of Africa, their keen sense of smell, hearing and sight lead them to their prey. When discovered, chaos ensues and excited, bloodthirsty canids unite as a pack, racing to keep their own generation alive. With no more than 5000 dogs left roaming the continent, it is a mixture of disease and loathing of their successful hunting methods that continue to put them under threat. 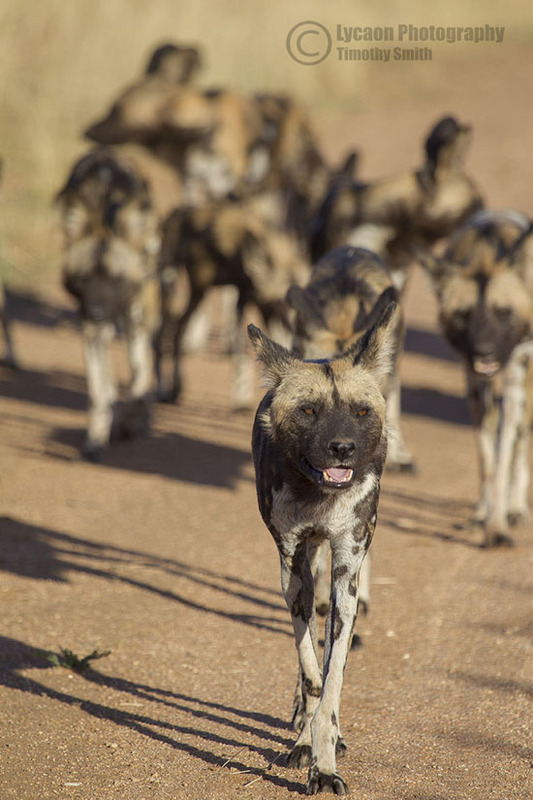 At the end of 2011, Erindi Private Game Reserve attempted for a third time to incorporate African Wild Dogs into the ecosystem and it has been a great success so far. 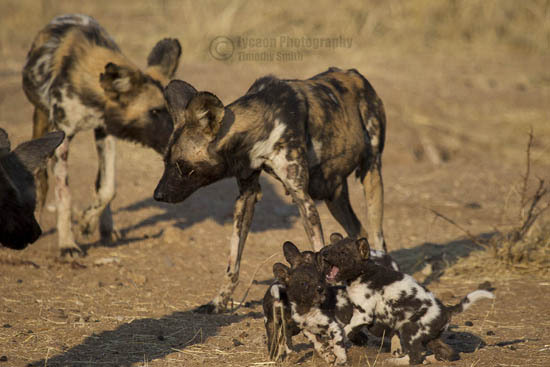 A total of fourteen were released, of which only two or three had hunting experience due to the background of the past Wild Dog introductions at Erindi. Countless attempts at bringing down prey were made without any reward. Only seven months after their release they pulled down a blue wildebeest calf in front of safari vehicles. Interactions with the local spotted hyena (Crocuta crocuta) impacted the momentum of the pack but thankfully they made a turnaround. In July 2012, the alpha female called Kaya gave birth to her first litter of pups, which were seen above the den of another pregnant female, Half-Moon. Half-Moon went beneath the den to give birth in September 2012. 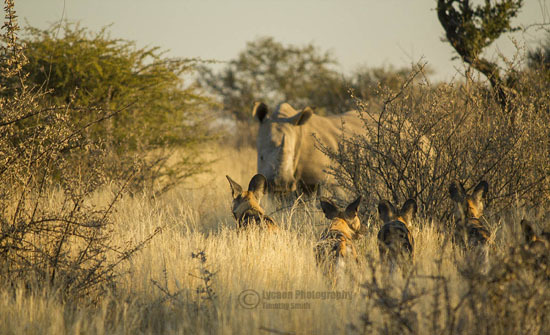 A strange situation was realized when six three-week-old pups started moving out of the old aardvark burrows of the den alongside three much older pups. Moon returned with one male back to the main pack. For a few months only a distance of 100 meters between her and Kaya was allowed. August 2013 brought the alpha female, Kaya, into a pro-active pup mode. 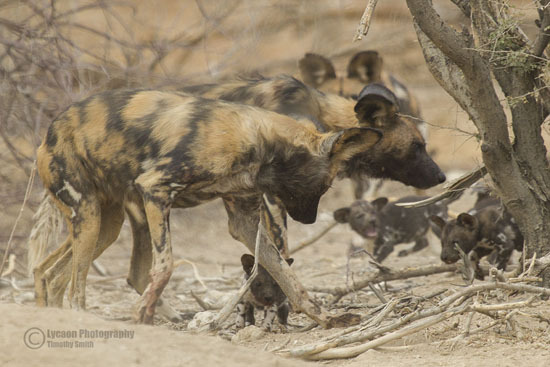 Selecting the same den sight as the previous year, giving it a spring clean by biting off all small branches of Acacia mellifura at the entrances, she gave birth to five pups on the 12th. Once the latest litter of pups emerged at ground level, three and half weeks after birth, they had a constant supply of regurgitated food and grew fast. December 2013 had brought the first rains but with most warthogs cleared out of the bush by hungry predators, the pack transformed from Warthog assassins to big game hunters. With their four month old youngsters increasing in size and larger food requirements their targets were blesbok, red hartebeest, blue wildebeest, kudu and impala. Rare animals on the Erindi Wild Dog pack’s menu included ostrich, two giraffe calves, a female eland (their largest kill to date) and a big bull oryx. They have only successfully brought down an oryx once since their release over two years ago. 2014 again produced another litter of pups for the pack but they decided to move their den site location not far from the previously used area. Seven pups were seen very early after birth as Kaya was viewed moving them from one hole to another, only days old. This den selection site was different, much more open and in a way showcased their maturity as a pack. They now had a den in a location where members of the pack could see other potential predators approaching at 360 degrees. 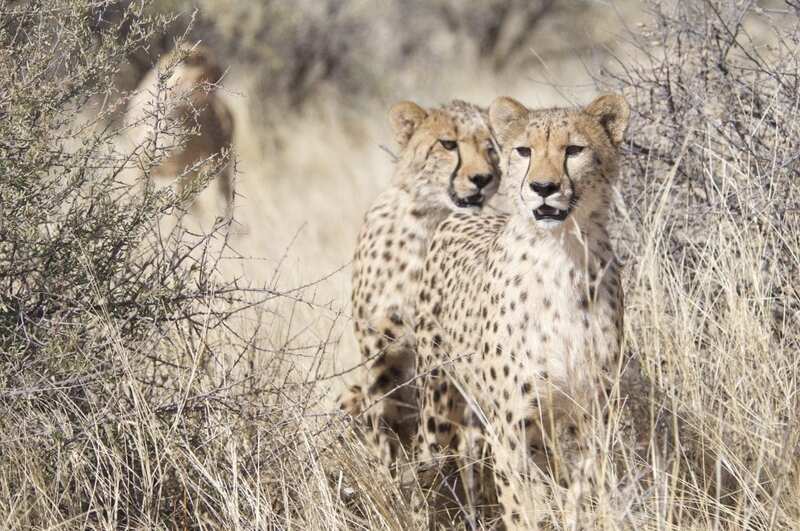 The future is looking bright for the pack of fourteen, lets sit back and look forward to the twists and successes of this current Erindi Private Game Reserve pack.